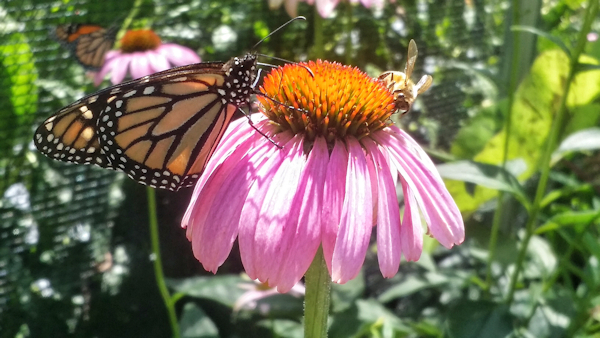 My most amazing, fantastic day began with a trip to the Butterfly Garden currently on exhibit at Smith-Gilbert Gardens. I took my boys along. Sean (14), my oldest, regaled us with appropriate science facts as if he were a magician pulling an infinite string of colorful handkerchiefs from his sleeve. James, nearly 13, found his own magic as a gentle giant playing with bubbles in the children’s garden. Our quiet walk of the garden grounds featured a whimsical koi pond, artsy sculptures, and an enchanting bonsai collection. Fluttering wings, hungry caterpillars, and teeny tiny toads. The gentle, rolling paths through inviting gardens and groves proved a very relaxing contrast to our usual hikes of rugged terrain. The Butterfly Exhibit at Smith-Gilbert Gardens is open daily through September 10, 2016 in Kennesaw, Georgia.